Enjoy your meal by making your advance bookings at Zomato for your favorite restaurants and enjoy a cashback upto 15% if you are using paytm for the first time at Zomato. Fetch this cashback to make your lunch/dinner more reasonable only with Paytm. You can explore various restaurants nearby your place with variety of cuizines. 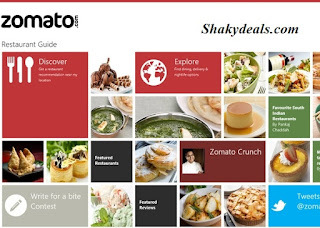 With Zomato, you can easily choose your destination for having your meal provided with all the details including menu, prices, ambience etc..So use Paytm and grab this cashback now!!! Choose your desired restaurants and make bookings. Proceed to make payment using your Paytm wallet for the first time. Minimum Order value is not applicable. Maximum cashback upto Rs.100 only. No cashback will be entertained in case of partial or full order cancellation. Valid for single user per transaction. Grab a bite of delicious food at your favorite restaurant available only at Zomato! !